Rother District Council (RDC) is consulting residents on how it can best manage and protect the district’s public realm. The term public realm includes maintenance of pavements and road surfaces, street furniture, signage, post boxes, telephone kiosks, trees and planting. 4) Ensure the quality of the public realm is given due weight in the delivery of the community aspirations in Rye’s Neighbourhood Plan including the introduction of town gateways; rethinking Ferry Road and Station Approach road layout; the introduction of a parking strategy with the introduction of Civil Parking Enforcement (CPE); and improved road signage. The consultation also lays out its commitment to work in partnership with other delivery authorities such as ESCC and Rye Town Council “to set out agreed use of appropriate materials and finishes for maintenance and repairs, particularly in conservation areas, and the presumption of preservation of historic public realm features”. In addition, there is a commitment to “involve stakeholders at early stages in the design process for new public-realm improvement schemes”. The RDC consultation coincides with the 90th anniversary of Living Streets – the campaign to clear pavements of cars and clutter. Originally set up in 1929 as the Pedestrians Association, its campaigning led to the UK’s first zebra crossing and the introduction of speed limits. It has since grown into a national organisation with affiliated groups all over the UK including in Lewes and Eastbourne. Living Streets’ current campaign is calling for the UK government to follow the Scottish lead and introduce legislation to ban cars from parking on pavements. If you would like to read more on Rother’s public realm consultation you can do so here and have until March 8 to comment. Alternatively, if you want to help create a better walking environment and are interested in setting up a Living Streets group in Rye, more information can be found here. 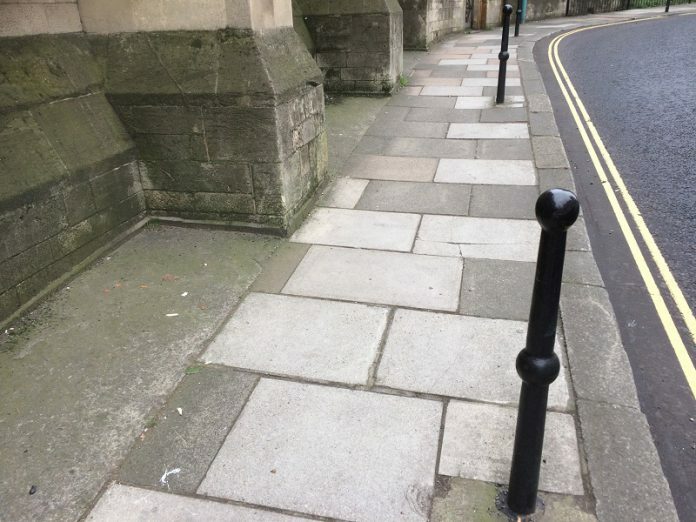 While pavement bollards do deter parking they are, unfortunately, subject to fairly strict siting regulations that require a specific distance between bollard and kerb while also allowing sufficient unobstructed pavement width. Many of Rye’s pavements are too narrow for their installation. However, pavement parking in a restricted zone is not legal, and can thus be dealt with by enforcement – when that exists. I have just read Rother DC’s draft document and find little if anything to disagree with. The visions and strategic objectives are laudable. I do wonder though what the purpose of the consultation is, given the dire and continued lack of public funding. The public realm is becoming increasingly dilapidated and neglected – publishing this document will not change that. As one of many examples, I’m thinking of a hole in the pavement in front of the Landgate, where there was once an uplighter. It has been many years since these lights proudly lit up the Landgate. Rother DC is intending to dip into its reserves by £5m this year, such is the financial plight. In contrast, the 1000 wealthiest people in Briton, who were worth £413 billion in pre-recession 2008, are now worth £724 billion. I suppose it is up to voters as to where the nation’s money goes. Personally, I think it is high time for a redistribution of wealth rather than the continuous funnelling towards the wealthiest. If somebody can explain to me why the majority continue to encourage what is happening, I would be grateful to know!